It’s been a while since the last Scoff Saturday with the ladies at The Potted Pig in Cardiff and even longer since we last fell in love with The Duck and Waffle back in January. As you can see there is a theme to our girlie meet ups- MEAT! 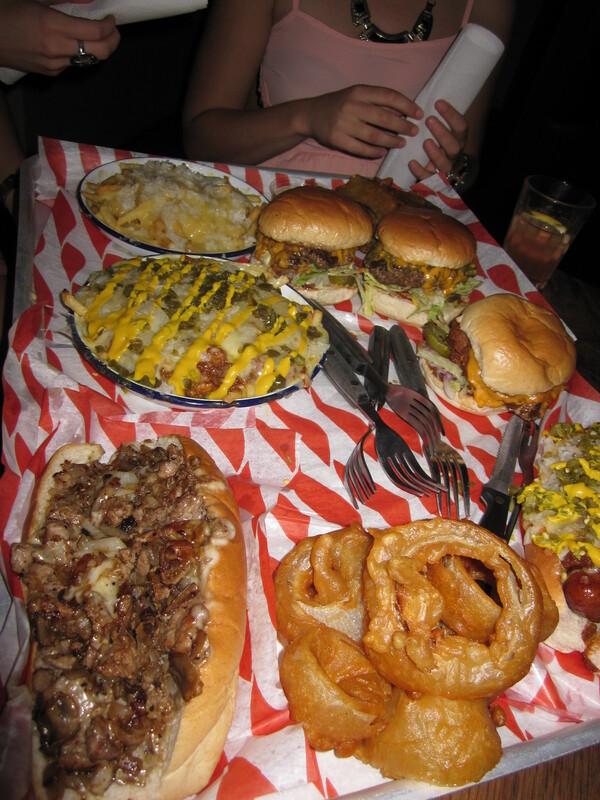 I’ve seen for a while on twitter pictures of meaty, cheese platter goodness and wanted in MEATliquor. We love meat. 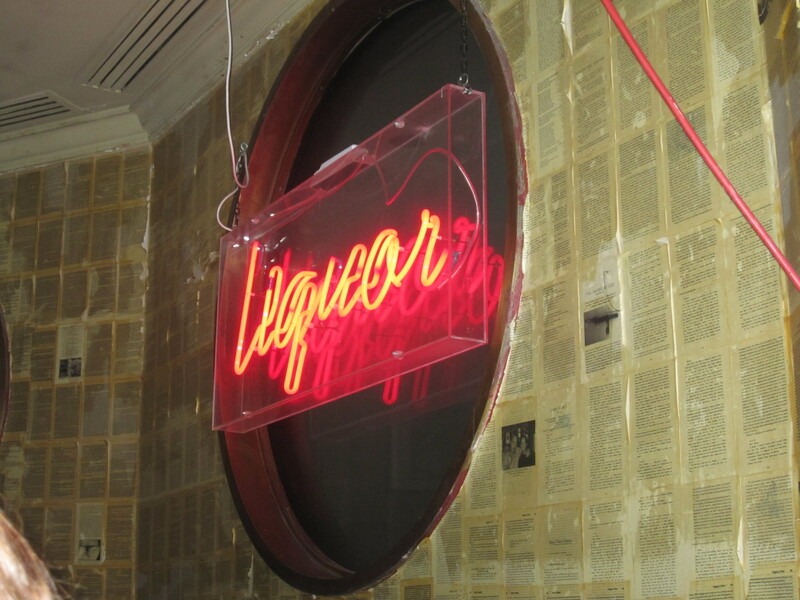 We love liquor. So there was nothing holding us back. In true Scoff Saturday style we over ordered to the max. Even the waiter thought he would step in and mention that we ordered a hell of lot of food for some girls. We did good and ploughed through but ultimately we’re defeated. On one of the hottest days of the year, multiple jugs of their Ice T cocktail went down far to easily whilst being a lethal mixture of all good things in life. In a darken room, with neon meat signs and butcher curtains, leave your vegetarian friends at home. There was no question as to whether we were going to get some of the Bingo Wings to start. 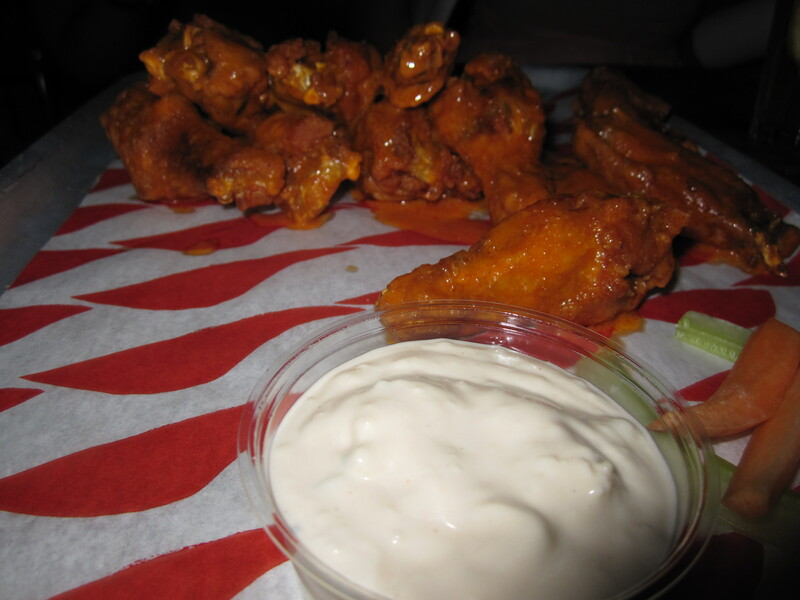 A fiery pile of juicy chicken wings bathed in hot pepper sauce served with intense blue cheese dip and the over looked celery and carrot sticks. Damn they were good. I would of been happy if they just kept bring trays of these bad boys out. The fire goes deep with these little devils which had me addicted to them. Then the platters and fries started arriving and damn it was a lot of food. Going for side dishes of crispy onion rings, deep fried pickles, cheese fries, chilli cheese fries and Phili cheese fries, yes that was just our side dishes to go along with our main meals. But we were there for the long haul, not reason to rush this. The onion rings were some of the crispiest onion rings I’ve ever had and there was some batter shrapnel flying in all directions when we tucked in. 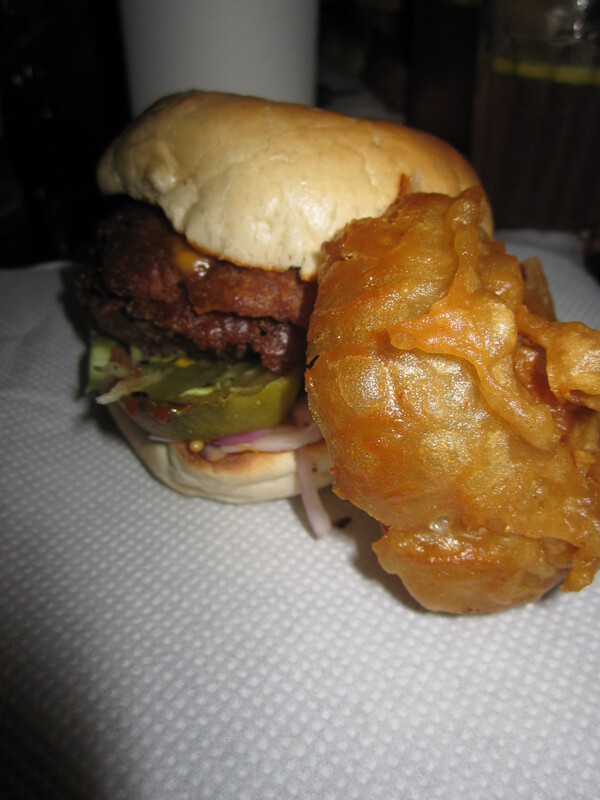 One of my favourite items was the deep fried pickles, strips of sweet dill pickles in a light batter fried to a crisp. 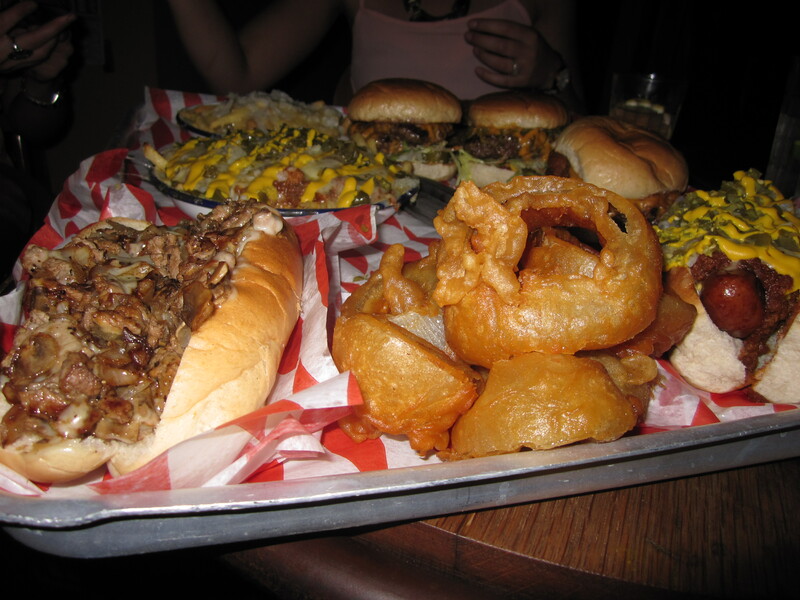 Ok, I’ve changed my mind, just bring me a platter of the Bingo Wings, Onion Rings and Deep Fried Pickles. Bottom left of the picture above was Eliza’s Mushroom Provolone Cheesesteak, shaved rump steak, onions, mushrooms, provolone cheese all in a groaning bun. Half of it may have been wrapped to go and was setting off the security alarms in all the shops as there was just so much meat and cheese in it. I went for the Bacon Cheeseburger as everything in life is better with bacon. Juicy burger, strong cheese, flamed grilled bacon, plenty of pickles and best of all no warm soggy limp sorry for its self-tomato slice. I think I’ve found my favourite burger. 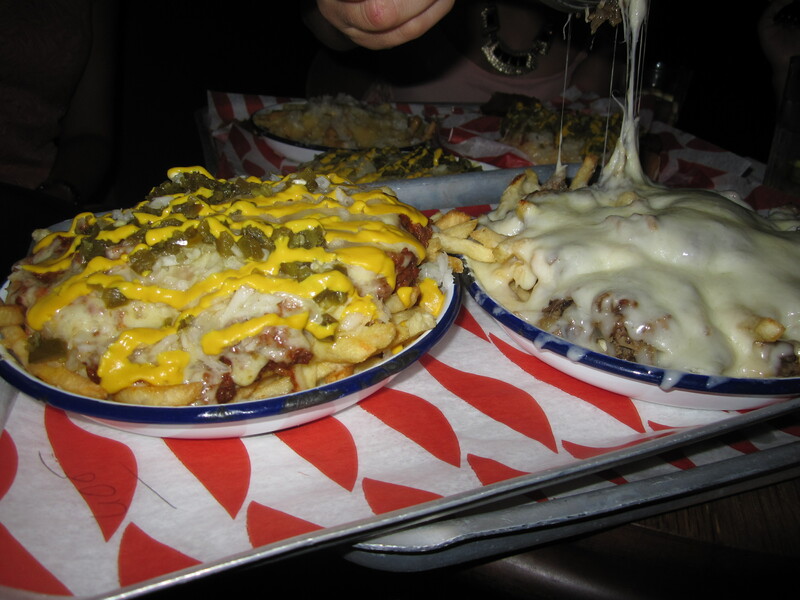 That’s right, there are fries under that mountain of cheese, more steak and meat chilli. We may of over ordered but I regret nothing. In fact, I plan on doing it all again and even trying out one of their desserts next time. 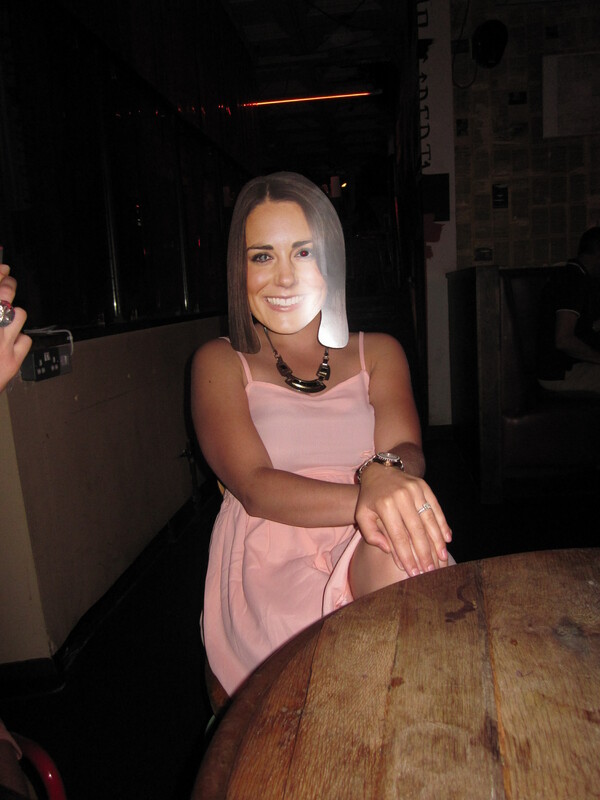 Even a Royal came to visit and eat some meat with us, Ceri and Emma being big fans went into Royal baby chatter, while Eliza and I just tried to digest our food in the corner. Another great Scoff Saturday with the girls and topped off nicely drinking rosé on a roof terrace overlooking London with great friends laughing loudly.